Launched on a wave of hype last Friday, the premiere of Channel 4's new office-based sitcom The IT Crowd drew a disappointing 1.8m viewers. 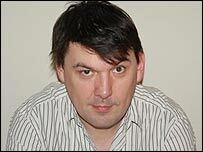 But its writer Graham Linehan, whose previous successes include Father Ted and Black Books, remains optimistic about the show's chances, saying he is "playing the long game". "The first series of Father Ted went pretty unnoticed," the 36-year-old Irishman told the BBC News website. "But after we won a few awards, the second series was seen by a lot more people - who then went back and discovered the first. "Hype is useful in the short term, but in the long term the show will stand or fall on its own merits. "I was very happy Channel 4 put so much weight behind it, but in the end it's just 23 minutes of nonsense." That nonsense stems from Roy (Chris O'Dowd) and Moss (Richard Ayoade), a pair of gormless IT technicians whose social ineptitude make them pariahs at the upscale London office where they work. Into their grotty basement domain comes Jen (Katherine Parkinson), who has somehow been appointed their line manager despite knowing nothing about computers. Shot on a three-walled set in front of a live studio audience, The IT Crowd is a deliberate throwback to such classic British favourites as Dad's Army and Steptoe And Son. 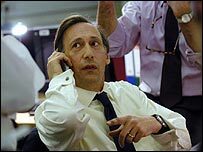 The success of shows like The Office and The Thick Of It, which use a more realistic format reminiscent of the fly-on-the-wall documentary, had prompted speculation that the traditional TV comedy's time had passed. Linehan is reluctant to be seen as "the saviour of the sitcom", but admits he was keen to challenge current orthodoxy. "There was a bit of surprise when people realised I wanted to do it in front of an audience, because that style is not in vogue at the moment. "But I always think that if everybody's doing one thing, it's probably an idea to do the exact opposite. "People are very quick to pounce on ideas like the death of the sitcom because it's exciting," he continues. "But I trust my instincts, so I'm going to do it my way and hope people come to me." Despite the show's lukewarm reception, Linehan hopes he will be able to develop his creations further in a second series. "I'll keep the characters as they are, but I'll try to deepen them and make them more interesting. "The way they appear in the first series is quite simple, but I want to burrow down a bit further and see what makes them unique." As yet a follow-up series has yet to be commissioned, although according to Linehan "the initial signs are good". "I think we've created something pretty special, but I'm too close to it to know if I've succeeded. "And anyway, you only really know how well a show is doing when it's repeated."